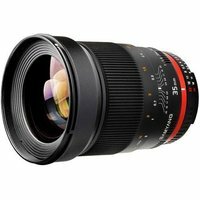 The Samyang 35mm f1.4 AS UMC is a bright, wide-angle prime lens suited for portraits, travel and reportage photography. UMC stands for Ultra Multi Coated, which indicates that the lens has been covered with multi-layered, anti-reflective coating which minimises reflections and increases image contrast. This manual focus only lens is designed for Sony's full-frame a7 II, a7R II and a7S II compact system cameras, as well as their APS-C models.